· Sketch by Donovan in Veronica's diary trip. · Some clouds, a bit of rain, a bit of sun, a bit of wind... there you go! - said Donovan while drawing this. 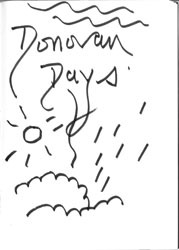 · Autographs session after the screening of the Sunshine Superman DVD, Donovan Days.